All PALOMINO POINT homes currently listed for sale in Draper as of 04/25/2019 are shown below. You can change the search criteria at any time by pressing the 'Change Search' button below. 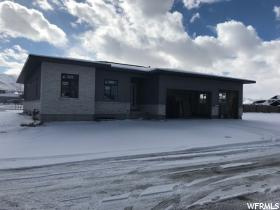 "FANTASTIC new construction modern rambler located in Palomino Estates, Draper!! This fantastic neighborhood is close to schools, freeway access and shops!! This modern rambler features: a gourmet kitchen with two kitchen islands, large pantry with a butlers prep area, spacious master suite with walk-in closets and a gorgeous bath, FULLY finished basement with a 2nd laundry area, theater room area, 2nd kitchen and so much more! Come see for yourself - you won't be disappointed!!" " GORGEOUS New Prairie Modern 2 Story in Palomino Estates, Draper! A Park City feel in Draper! This location is perfect for easy access to free-way, shops and schools! This home features: vaulted ceilings, HUGE master suite on main floor with outstanding master bath, doubled sided fireplace to enjoy indoors and out while sitting under the covered deck, gourmet kitchen with stainless appliances, large island and wonderful butler pantry with awesome prep space and so much more. Come view this property TODAY! You definitely will not be disappointed!!" "PERFECT completely finished new rambler in Palomino Estates in Draper!! Great location close to freeway access, shops and schools! This fantastic home features: a fully finished basement with a home gym area, full wet bar, 2nd laundry room and over-sized bedrooms and that is just the basement!!! The main floor boosts of 8' doors, gourmet kitchen with over-sized island, stainless appliances, awesome master suite with a pass-thru to the laundry room and so much more. Come see this beauty TODAY - you won't be disappointed!!"